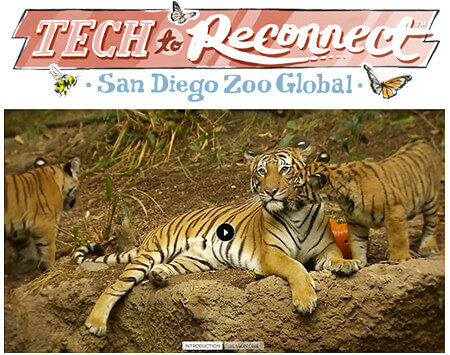 The Academy is excited to share another San Diego Zoo Global initiative called Tech to Reconnect. The Academy community is innovative by nature, so naturally we thought this could be of interest to you. How can technology help us reconnect with the natural world? Broadly defined, technology consists of things that humans make. From compasses and magnifying glasses to telescopes, microscopes, and computers, devices have long been a part of human exploration and discovery. The present era is no different. Technologies can enable deeper understanding and empathy with our environment. In accordance with our organizational vision to lead the fight against extinction, our Tech to Reconnect team prototypes and promotes technologies that intellectually, emotionally, and through senses connect people with the natural world, excite the imagination, and inspire action. Visit our website to see our bat echolocation mask, butterfly navigation vest, and giraffe vision simulator as some examples. Join us at our speaker events, where creative and technical communities come together to discuss and create new conservation technologies. View an introductory video on the Tech to Reconnect website. San Diego Zoo Global Academy Puts Rosamond Gifford Zoo at Burnet Park in the Spotlight! The Rosamond Gifford Zoo at Burnet Park is part of the Academy's collaborative learning environment! Welcome! A San Diego Zoo Global Academy AZA Conference-Related Thank You! Thank you for coming by to see us at the AZA Conference in Salt Lake City. Thank you to AZA for a great conference, and thank you to Utah's Hogle Zoo and the Tracy Aviary, too! The San Diego Zoo Global Academy's Zoonotic Disease course is being translated into Spanish, and is nearing completion. In anticipation of its availability in the Academy catalog, we have put a link to a sample of the course on the Academy website. 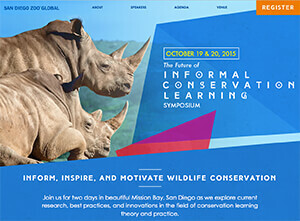 San Diego Zoo Global is thrilled to announce The Future of Informal Conservation Learning Symposium, October 19-20, 2015 in San Diego, California. This symposium will explore current research, best practices, and innovations in conservation learning theory and practice, including: effective ways to promote environmental stewardship and shape conservation behaviors; evaluating learning and measuring conservation impact; participatory learning and inquiry; and learning in free-choice settings. We invite you to join us in advancing our field by generating innovative ideas to revolutionize learning in informal institutions, creating opportunities for partnerships across the conservation learning community, and expanding the skills and knowledge needed to inspire and motivate people to save wildlife. Hear from experts in the field, participate in round-table discussions, network with colleagues, and enjoy beautiful Mission Bay in San Diego. Click here to see a complete list of speakers, lodging information, and to register. For additional information, contact Josh Garman (Vision, Innovation, and Strategy Specialist) by phone at (619) 231-1515 x4551 or at jgarman@sandiegozoo.org. 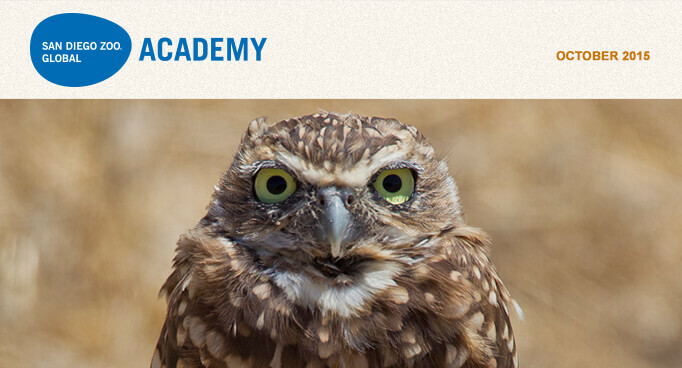 The Academy catalog of online courses goes well beyond animal care courses and interpretation training, and the Customer Service Fundamentals course is one of those. This course will teach participants how to understand customer types and the importance of customer service. It instructs how to build rapport and communicate with customers, including responding to customers' needs and exceeding their expectations. If you are a site-wide administrator for your Academy-related site, you can set up Reporting Groups to automatically assign a course or courses of your choosing to newly added group members. For instance, it could be useful to create a group called "New Hires," and then select one or more courses to be assigned only to the new members of the group. That way, they are automatically assigned required courses as soon as their account is established, and it will save you the step of using the Course Assignment tool for your new hires! You can ask for a walk-through of this process during any Administrator's Users Group Webinar. Please join us for the Administrator's Users Group Webinar hosted by Academy partner CypherWorx. The next webinar is Wednesday, October 21, at 11 a.m. PDT. My hearing is not my keenest sense. Genetics and working as a DJ to earn my way through graduate and law schools took a toll on my auditory acuity. Fortunately, except for moments of unrestrained enthusiasm, I work hard to compensate by listening better than I hear. Sounds impossible, but it is one of the most important factors in shifting from "being right to doing right" for animals. If you have a moment to read or listen to this message, you will understand the unfair advantage good listeners possess. Let's explore together the possibilities for listening as a fundamental tool for improvement with zoological staff and volunteers, accreditation and agency inspectors, and critics. Staff and volunteers, especially those not traditionally considered part of the AWA compliance or animal welfare effort (e.g., buildings and grounds, maintenance, safety, security, and others), may not hear things they are not listening for, because their role has been narrowly proscribed. Sensitized to opportunities to contribute by listening for things like certain comments, feedback, or noises could be the razor's edge in making something better. Likewise, listening to each other, especially when our perspectives about an animal or its care may differ, helps us better understand the challenges and opportunities in a given situation. As an attorney, I have witnessed far too many situations where better communication, including effective listening, would have led to better outcomes, sometimes even for the animals. It is especially in those moments where colleagues may respectfully have differing takes that good listening is most important. Indeed, there is no greater sign of respect. Accrediting and particularly AWA compliance inspections are forums where good listening is absolutely invaluable. Listening carefully and understanding an inspector's concerns and perceptions will allow for more effective action than almost anything you might say to the inspector. Sometimes, when called in to help address "back end" challenges, including working with APHIS Animal Care, meeting and speaking with staff and agency representatives is often much more insightful than whatever may be recorded in an inspection report. Sometimes I feel like my role is more that of an interpreter than some high-flying legal eagle with superhero-like powers. Listening to staff can reveal disconnects, frustrations, and great ideas and passion for improvement waiting to be heard and encouraged. A number of times, retrospective review of a challenging situation has shown that an inspector was working to cooperatively guide a facility to review or improve certain things, rather than "setting them up" for bigger challenges. Similarly, there are times when taking care to be certain an inspector fully understands alternative protective measures, perhaps obviating a potential noncompliance, can mean the difference between a clean inspection and a public relations fiasco. Restating what one thinks they have heard and seeking clarification are simple ways to confirm that you have listened and have an accurate understanding of what is required. This should be done throughout an inspection and at the inspection exit briefing. An interesting confluence of the first two contexts arises when a zoological organization has an extraordinarily deliberative process for making animal and veterinary care decisions, and an inspector might take that to suggest the attending veterinarian lacks the appropriate authority to oversee veterinary care as required by the AWA. Well, in such a situation, the organization's team should use its communication prowess to listen to the inspector's concerns and demonstrate the benefits of collaborative conversation in better informing what, in the end, are veterinary judgments. Critics may provide the most exciting opportunity for listening well. Sometimes the "gotcha" game can be very trying, and no more so than while dealing with an animal-related event or tragedy. In those instances, it is so easy to dismiss differing and often harsh criticisms as "nonsense" from a "dirty rotten whatchamacallit" or someone like that. I understand. I also know that many times when I was able to check my sometimes too-considerable ego and listen to such criticism, I have discovered lessons worth learning as to how I could improve or transcend that criticism. Underlying the criticism may be a shared concern for animal well-being, and hearing that rather than the attack element provides the best response imaginable—doing something different or new to help an animal or animals, rather than fighting with other people. Once again, that is the distinction between "being right and doing right for animals." In my own home, our beautiful Memphis Grace simply listens and loves every day. No wonder she herself is so well loved and respected. Listening can really be an unfair advantage in continuously improving ourselves and animal welfare. Online training is a management tool for the organization. At San Diego Zoo Global, we have our initial requirements for employee training summarized in a memo from our Chief Executive Officer, Chief Human Resource Officer, and Chief Life Science Officer. The next version of this memo is in the works, and it will identify the next phase of training requirements. Additionally, our Human Resources department drafted Employee Policies related to use of My Academy. Please let us know if any of these documents could be helpful for the online training efforts at your institution. Have your volunteers use the eLearning site to give updates on the animals from one shift to the other. Our Sea Turtle Healing Center Volunteers (and Healing Center Manager) use the "Discussion" feature to update the next shift on any changes in diet, medication, and animal condition or new turtles that have been rescued. Thus, if a volunteer only comes in once a week or misses a week, they still remain current on what to expect when they come in next. The Academy's online platform has vast potential for safety training in our industry. The positive impact this training tool can have in the area of safety should be magnified if it is pursued in collaboration. With that in mind, we want to introduce our fellow zoos and aquariums to San Diego Zoo Global's Associate Director of Risk Management, Ed Chargualaf. Mr. Chargualaf will be developing training courses for San Diego Zoo Global's employee site, My Academy. 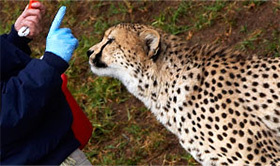 If you are interested, he encourages your institution to connect with him, so the benefits of safety-related training for zoos and aquariums can be shared, whenever possible. Ed Chargualaf comes to San Diego Zoo Global as the Associate Director for Risk Management with over 25 years of environmental health & safety (EHS) experience. He is a Registered Environmental Professional (REP), a Certified Environmental & Safety Compliance Officer (CESCO), and a Certified Natural Resource Manager (CNRM). He is a certified lead auditor and, as a member of the National Guard Bureau Environmental Advisory Board, established a national training program that addressed compliance with federal, state, local, and international requirements for all EHS program areas. In addition, Mr. Chargualaf has conducted EHS compliance audits throughout the United States and in Japan, Korea, China, Australia, and several Pacific Island countries, and has developed compliance strategies to ensure operational goals are achieved. Mr. Chargualaf is a graduate of the University of Guam and the University of Hawaii, and he is a faculty member for the University of Phoenix. He is also a member of the American Society of Safety Engineers and the National Association of Environmental Professionals. Have questions regarding the Safety helpful hint? Or, do you want to participate in a Safety Training-related network? Ask Ed Chargualaf, SDZG for more information at echargualaf@sandiegozoo.org. Click here for the September 25 Zoo & Conservation News.